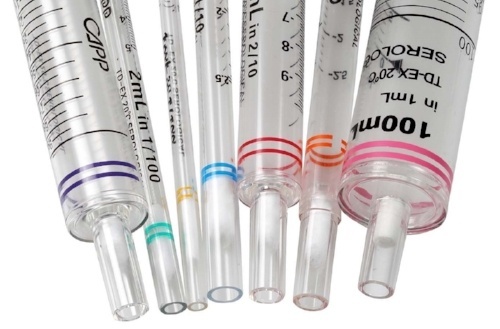 Designed for accurate and rapid fluid dispensing, serological pipettes are sterile, pyrogen-free, cotton plugged, and can be used for a variety of liquid handling applications (certified DNase/RNase free). They are manufactured from transparent medical grade polystyrene and sterilized by gamma radiation. Commonly utilized in the laboratory for transferring a few milliliters of liquid to up to 100 mL in volume via a serological pipettor. 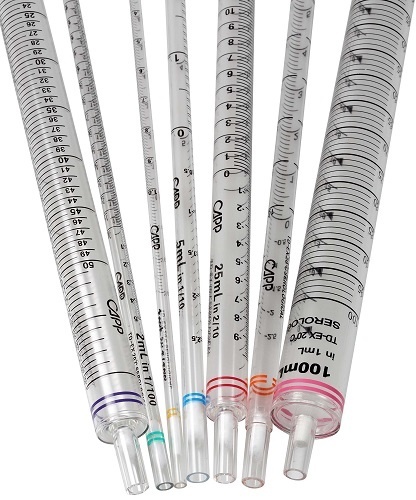 Serological pipettes can be used for mixing chemical solutions, mixing cell suspension, transferring liquids, and accurate measurements of liquid. Conveniently, all serological pipettors will fit into any serological pipettor and allow for fast volumetric measurements. Serological pipettes allow even distribution of cells throughout a solution, a key step in the cell culture process. They can also be used to gently mix suspensions, reagents, or even creating gradients in reagent layering. Pipette.com offers a plethora of serological pipette options that will suit any laboratory need you might have from basic volumetric measuring to cell suspension and reagent mixing.